The Sentosa Express is a straddle-beam monorail line connecting HarbourFront on the Singapore mainland to Sentosa Island. 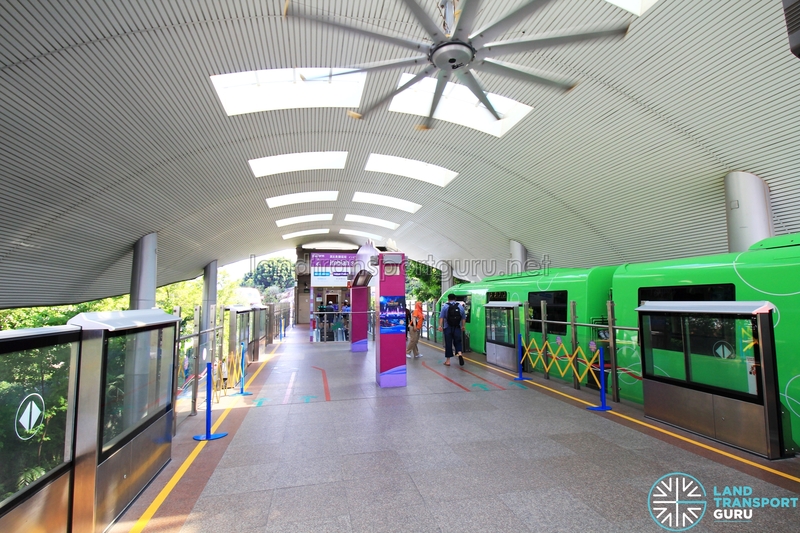 Privately owned and operated by the Sentosa Development Corporation, the line brings major attractions in Sentosa Island within convenient reach of HarbourFront, a transport node connecting with NE1 CC29 HarbourFront MRT Station. At Waterfront and Beach stations, Sentosa bus services bring commuters to other parts of the island. The line is fully elevated, 2.1-kilometres long, with 4 stations. A full journey takes roughly 8 minutes. 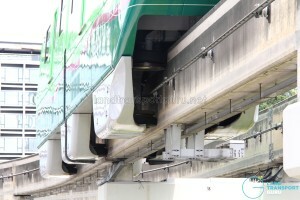 Rolling stock is provided by Hitachi and based out of a small depot near Beach station. Construction began in June 2003 and was completed in December 2006, at a cost of S$140 million. The line started operations on 15 January 2007 with the exception of Waterfront station. 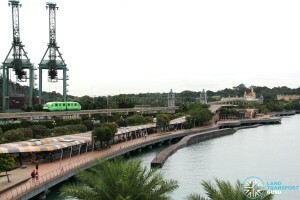 In 2008, the unopened station was dismantled and rebuilt to accommodate large crowds expected after the Resorts World Sentosa Integrated Resort opened. Waterfront station eventually opened on 1 February 2010. 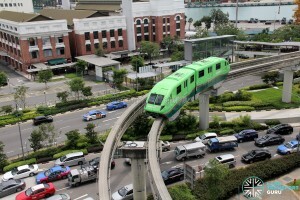 The Sentosa Express replaces the older Sentosa Monorail system, which opened in 1982 and operated a unidirectional, counter-clockwise loop through seven stations located around the western half of the island. It closed on March 16 2005. 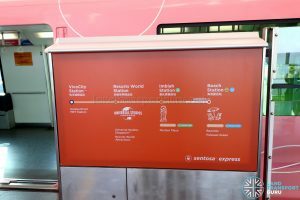 The Sentosa Express operates bi-directional services along a single line from Sentosa to Beach station. (Counter-intuitively, Sentosa station is located at HarbourFront, while Waterfront, Imbiah and Beach stations are located within Sentosa island). Trains travel on the left, similar to right-hand-drive traffic flow in Singapore. 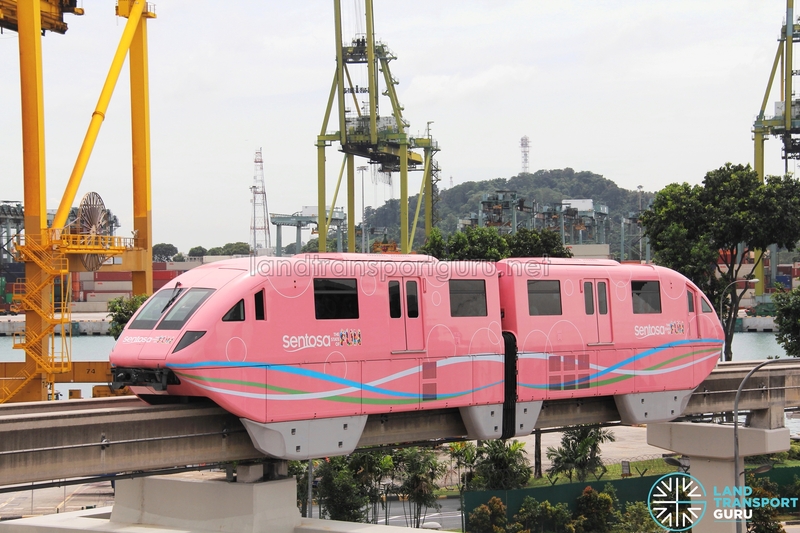 Each station of the Sentosa Express is colour-coded for easy recognition. All stations are equipped with lifts for disabled access. S1 VivoCity station connects to NE1 CC29 HarbourFront MRT Station. The Sentosa Express charges a S$4 fare upon entry at VivoCity station (at HarbourFront). Thereafter, rides within Sentosa island and outbound rides exiting at VivoCity station are free of charge for all commuters, regardless if they have entered Sentosa island using the Sentosa Express. In addition, TransitLink Child Concession Card holders whom are below 3 years old enjoy free admission. 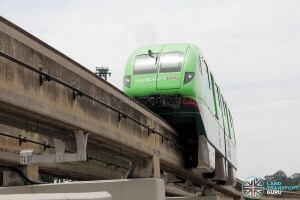 The Sentosa Express operates on the Hitachi small-type monorail rolling stock, operating in a two-car formation with an operator’s cab at each end. Cars are permanently coupled with a gangway connection in between. 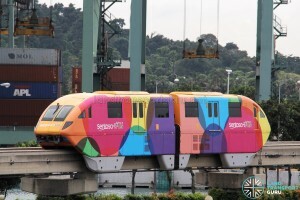 Seven trains are in service, each painted in a different colour scheme: Red, Orange, Green, Blue, Purple, Pink and Yellow. 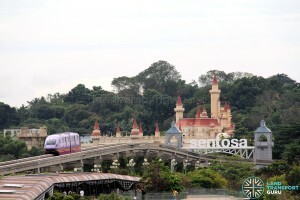 All trains are based out of the Sentosa Express depot next to Beach station, which also stables maintenance vehicles. Due to signalling upgrading works, the Sentosa Express’ operating hours were shortened between Mondays and Thursdays from 1 May 2016 to 31 December 2016 and 3 Jan 2017 to 30 Nov 2017, with the last trains departing Sentosa and Beach stations at 10 pm, two hours early. A free shuttle bus service was put in place, running from 10 pm to midnight at 15-minute intervals. Sentosa and Waterfront stations were renamed to VivoCity and Resorts World stations respectively from 1 April 2019. The name change was done to better reflect the nature of nearby developments.